Gauge Invariance: "Majorana" made two times last week! "Majorana" made two times last week! Last week, two different groups, one at Delft and the other from Sweden, France, and China, reported observation of the "Majorana quasiparticle" in condensed matter. (1) V Mourik, K Zuo, S M Frolov, S R Plissard, E P A M Bakkers, and L P Kouwenhoven, "Signatures of Majorana fermions in hybrid superconductor-semiconductor nanowire devices"
Here I discuss the underlying physics of the phenomenon and the differences between the two experiments. A semiconductor wire with high Lande g-factor shows splitting of the well-known energy-momentum parabola into two shifted parabolas one to the left and one to the right for spin up and spin down electrons (figure below). In magnetic field these two parabola are smeared and a parabola becomes nested inside a double-minima parabola (black lines in the figure below.) The gap between the two black parabola is called Zeeman gap. Note also the point where blue and red curves collide are usually set to be the chemical potential. the normal metal N reservoirs. If s-wave superconductivity is proximated to this wire, an induced gap appears that tries to couple two "almost" parallel spins. Note that for s-wave superconductor in trivial phase (regular sense) the pairing occurs between spin up and down. In fact, the proximity of regular s-wave superconductor to a material with large spin-orbit interaction makes it possible to induce p-wave superconductor! If the induced superconductivity gap is too large (larger than the Zeeman gap) a regular p-wave superconductor must appear, but in the opposite case a two-fold degenerate ground state at zero energy appears that is topologically non-trivial, the so-called "the Majorana fermions." Both of these groups made similar devices with minor differences. In (1) a Gold reservoir plate placed next to a NbTiN superconductor reservoir plate, in (2) both plates are NbTi. Between the two there is almost 200nm gap, under which there are some gate voltages. An InSb semiconductor was placed on the top of the two reservoirs and the gap between. The gate voltage (shown in above figure in green line) can make a tunnel junction in the nanowire due to the electrical repulsion (large electric potential barrier). Now, both of the groups apply a magnetic field along the wire perpendicular to the spin orbit internal magnetic field. However group (1) applies it parallel with the wire first and then applies it in any orientation, the group (2) applies it only perpendicular to the substrate and the wire. This turns on the Zeeman gap in both cases. If the Zeeman gap be smaller than the superconducting gap a regular superconductor is made, but if is stronger and beats the superconducting gap the "Majorana" fermions starts to show up from. Given the induced superconducting gap in the wire between the two plates (before the tunnel gate in the superconducting side) is 0.25meV, one can finds the minimum magnetic field required for the Majorana fermions to appear ---"(superconducting gap)=(1/2)(Bohr magneton)(g-factor)(magnetic field)." The required magnetic field is B>150mT. In group (1) experiment the magnetic field is exposed to any orientations. They saw whenever it is perpendicular to the spin-orbit internal field a zero energy level appears (from which the conduction of cooper pairs becomes possible). This zero energy level was checked to see if it has a different nature such as Kondo effect or Andreev reflection. These two latter phenomena are ruled out because the zero energy levels they detect is insensitive to the external magnetic field. So the only scenario left that describes this insensitivity is that the Majorana fermions are located at the zero energy levels from which the tunneling is occurring. 3- the semiconductor in both works are InSb. 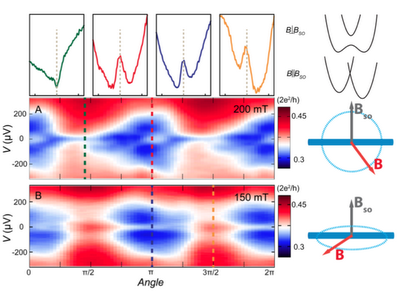 Rough calculation shows that the Majorana fermions should be seen in about 150mT. In the work (1) they saw it there, but in the work (2) they see zero bias peak in 10 times larger magnetic field (about 1T). Indeed the puzzle is already solved at the end of the work (1). 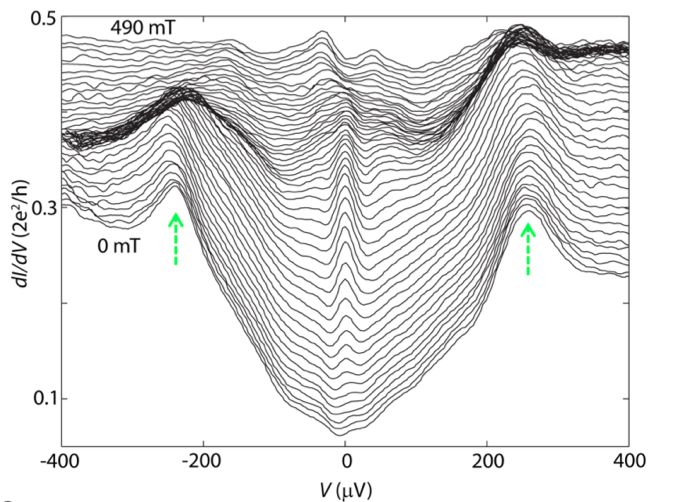 Group (1) produces results of the conductance by changing the angle of magnetic field and the nanowire and the substrate. They first change the magnetic field orientation parallel to the substrate. Note they define the angle to be between field and wire. This means magnetic field when is in 0 and pi degrees with the wire, it is perpendicular to the spin orbit magnetic and only in this case Majurana fermions appears (because only when the external field is perpendicular to the spin-orbit internal magnetic field spinless fermions can pair up via superconductivity and produce a funny quasiparticle called "the Majurana fermion.") In the following figure, the top graph shows that zero voltage peak only exists at the angle 0 and pi. Below it, they show the result where the external magnetic field is in a plane perpendicular to the spin-orbit magnetic field. In this case, the angle between the spin orbit and external magnetic fields is always 90 degrees and Majorana fermions is seen at any angle, so as you see the zero bias peak is seen at any angle. external magnetic field orientation. Angle defined between the field and the wire. perpendicular to the spin orbit field and thus the Majorana is seen at all angles. However, in work (2) the magnetic field is only perpendicular to the substrate, which is only one case among many from the lower graph, shown here by the yellow dashed line. This angle point is no convenient for this experiment due to the presence of many conduction levels. 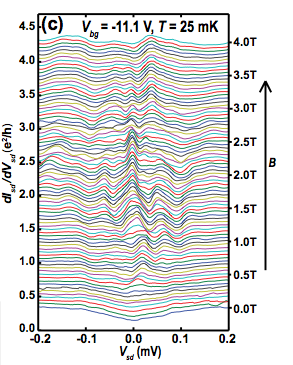 In fact this part of the graph is very "dirty" and crowded with other levels that makes it unsuitable for measurement. This is the main reason why they had to apply this huge (and problematic) magnetic field to push away all the Kondo and Andreev zero energy states (thanks to their magnetic field dependency) such that only Majurana fermions are left intact at zero energy. Fig.5: Shown in dashed line the single angle at which group (2) did their experiment. They chose a dirty part of the spectrum to see Majorana. In my point of view, although both works appear at the same time (the work of group (1) on March 23, 2012 and the work of group (2) on March 27, 2012) and although the quality of the work (1) is more convincing than (2), but both of these two works should be considered as the first signature of the artificial "Majorana" fermions. For more information about theory read the paper by Lutchyn as well as Oreg in the list of references in the papers.